Confederacy, Advertising & Illustrated Cover Balance, 1860-90's, of 17 covers; mostly allover merchant ads with nice bearing frankings, three stampless usages and two hand-carried including a Adams Express Company illustrated showing horse and rider alongside train, also includes are two 7-Star Flag allover patriotics franked with U.S. 1857, 3¢ red brown and both tied by Memphis, Ten. cds and four unused allover flag design; condition is mixed, Fine appearance. 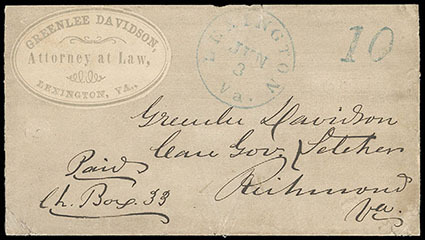 Confederacy, Better CSA Cover Balance, small group of 6 covers comprising #5 tied by "Knoxville Ten." 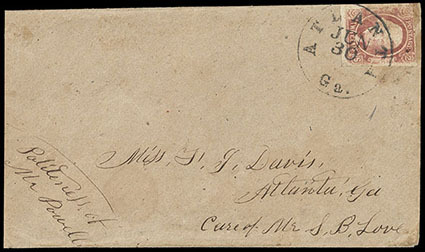 on cover to Atlanta, #5 tied by "Richmond Va. Jul 7, 1862" cds to Union Springs Ala., #5 (repaired) Petersburg Va. to Blue Wing N.C.; #5 tied by Ga. town cds to Sevierville E. Tenn., #8 tied by "Atlanta Ga. Jun 30" cds on homemade drop cover, #13 tied by "Charleston S.C." cds on cover to Camden S.C.; also includes a Tallahassee Flor. cds cover front with #8 pair that does not belong; some faults, F.-V.F. Scott No. 5, 8, 13 Estimate $500 - 750. Confederacy, Confederate Imprint Covers, group of 5 used and 1 unused envelopes, comprising "Head-Quarters, Military District of Florida" envelope with three #12 singles placed over imprint (lifted, 4th stamp missing), "Confederate States, Court House, Official Business" oval corner card cover front w/ #7 pair (one side flap only), "Head-Quarters, Georgia State Guard" gray corner card cover w/#11, "Q.M.Dpt., Official Business" shield corner card with ms. "Paid" to Chickasawhatchee Ga., C.S.A. Post Office Department, Auditor's Office" cover to Union Dist. S.C., and unused Treasurer's Office imprint cover. 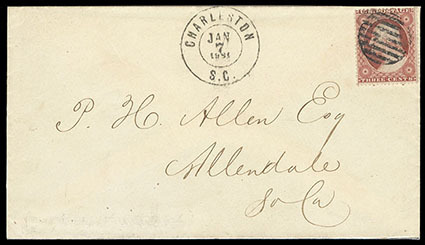 Confederacy, Independent State Usages, group of 4 covers with U.S. #26 franking comprising "Charleston S.C. Jan. 7 1861" cds cover, "Williamsburg Va. May 4 1861" cds cover, "Montgomery Ala. Jan 29, 1861" cds cover with rectangular grid cancel tying #26, "Calhoun Ga. Jan 20" circa 1861 cds cover. Confederacy, Provisional and Cover Balance, small group comprising Raleigh N.C. 5¢ red #68XU1 provisional entire (1981 CSA Cert), 10¢ rose #5 tied blue Columbia S.C. cds to Newberry S.C., #11 large margins from Spartanburg S.C. to Charleston Battalion care Capt. 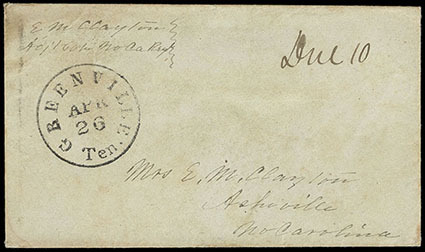 Lyman Co. B., and #11 pair on legal-size cover from Augusta Ga. to Cuthbert Ga.; some faults, F.-V.F (no photo). 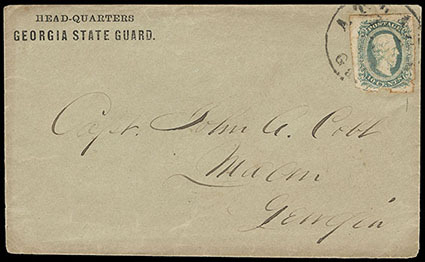 Confederacy, Soldiers Letter Due Covers, group of 9 covers including Greenville Ten. "Due 10" from "E.M. Clayton, Adjt. No. Ca. Regt. ", Yorktown Va. "Due 10" from "Private H.T. Jones, Cobbs Legion", 1861 Rome Ga. "Due 5" and Dublin Va. "Due 10" from "Wm. H. Dobbins, 3rd cp, Rifles. Phillips Legion", etc., F.-V.F.